What kind of cookies did your Grandma keep in her cookie jar? My grandma had a cookie drawer. These cookies taste like the ones I often found at her house. But they don’t look like them. She dropped big blobs on the cookie sheet. They usually grew together as they baked making for square cookies after she cut them apart. So they were pretty ugly–but still delicious. Last Christmas, I entered the revised recipe into the Star-Telegram Christmas cookie contest. My entry got as far as the semifinal round requiring me to take a box of baked cookies to the newspaper office. Sadly, that was the last I ever heard from that little adventure. Nevertheless, these are probably the most popular cookies I make. 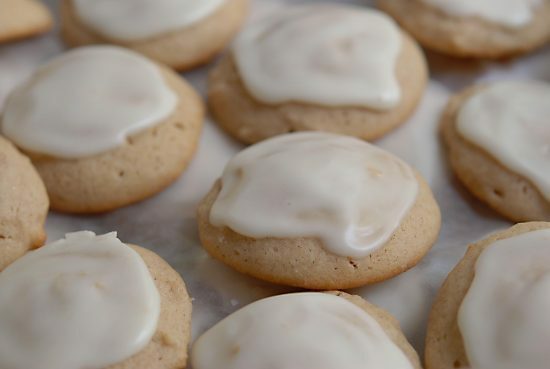 We especially enjoy taking these frosted morsels of deliciousness with us when camping. Did you notice the beat up cookie tin in the picture above? 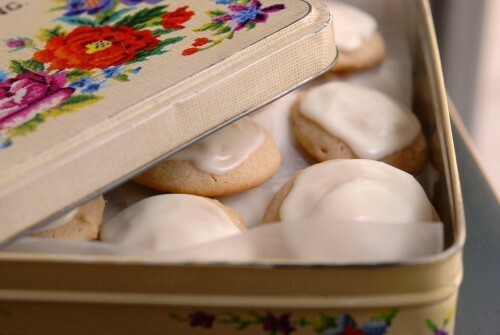 Whenever I show up with this tin, the Hastings family (our camping buddies) expect these Soft Cinnamon Cookies. We have become as sentimental about the tin as the cookies. The decorative tin was originally given to us full of goodies from Holland by our friends Harm Engel and Anke. As you can see, these cookies are more than just a cookie with icing to our family. They represent good friends and good memories. Try them for yourself. They are mild, soft and not too rich. They go down real easy–which is why I will NOT be putting them in the Skinny Secrets category. Cream shortening, sugar, and egg. Stir in yogurt and vanilla extract. Blend in flour, soda, salt, and cinnamon. Chill in freezer for about 30 minutes or 1-2 hours in the refrigerator. Use ice cream dipper to drop on to a lightly greased baking sheet or use parchment paper (or Silpat). Bake at 400 degrees for 8-10 minutes. When barely cool, ice with Browned Butter icing. Melt 2 tablespoons butter (do not substitute margarine) in a small skillet using low heat on stove till golden brown. Be careful not to burn. If any solids turn black, start over. Remove from heat and let cool slightly. Start out by adding about 1 tablespoon of milk into the butter. Stir in 2 cups powdered sugar and beat till smooth, adding milk as you go in very small increments till spreading consistency. Because icing becomes thick as it cools, stir in small amount of milk if necessary to make icing spreadable as you go. If you get it too thin, let it sit for a while or add more powdered sugar. I actually made these cookies… and they turned out GREAT!!!!!! I was scared about browning the butter, but it was so simple! My kids love them, and their friends at school love them…apparently they share homemade cookies from their lunchboxes. Maybe this will be a Christmas tradition that my kids can trace back to their great-grandma! I want to bake the cookies without the icing if I do will they not taste as good? I was just wondering if I can use a cookie cutter (such as a candy cane cutter) for these. Do you have a a rough guess for the calories in these?? 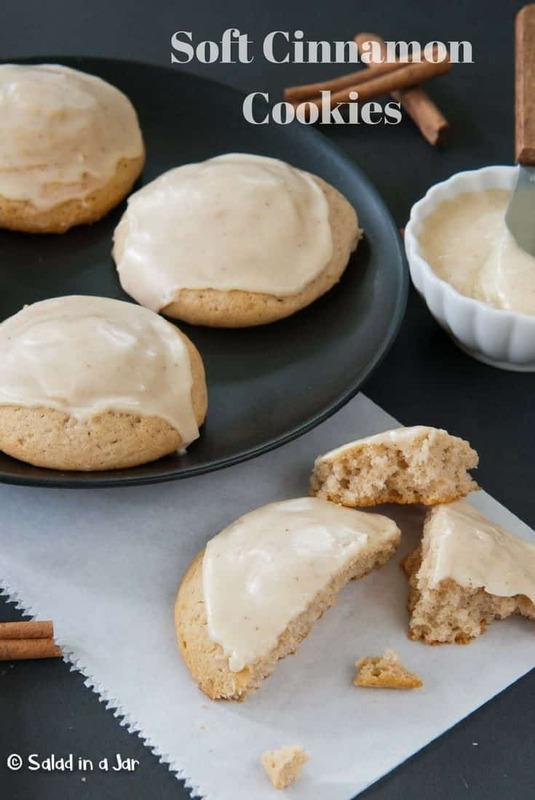 I plan to make these but noticed the use of yogurt or buttermilk. Does the liquid not make a difference in the consistency? Seems like the batter would be slightly thinner using buttermilk rather than yogurt. Which one do you use? I use whichever I have. If the yogurt is thick you might add a little milk but it doesn’t make that much difference. Either way, the dough needs to be chilled so it all turns out about the same. I am making these tonight…. About how much milk do you start the icing with?